This really has to make Russia and Saudi Arabia and the progressives very mad. Home » Random Thoughts » This really has to make Russia and Saudi Arabia and the progressives very mad. 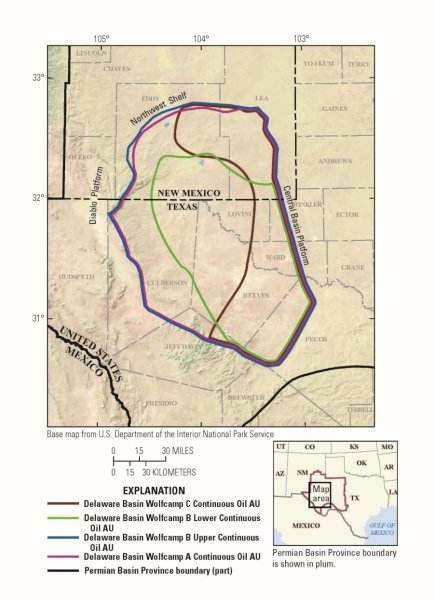 A new report on Thursday by the United States Geological Survey (USGS) discovered the largest continuous oil and gas resources EVER in the Texas and New Mexico Delaware Basin. The new report indicates the basin contains an estimated 46.3 billion barrels of oil plus 281 trillion cubic feet of gas and 20 billion barrels of NGL. Assessment units of the Wolfcamp Shale and Bone Spring Formation in the Delaware Basin of Texas and New Mexico. This is terrific news for American workers and consumers… Unless, of course, Democrats ever regain control of government. Today, the U.S. Department of the Interior announced the Wolfcamp Shale and overlying Bone Spring Formation in the Delaware Basin portion of Texas and New Mexico’s Permian Basin province contain an estimated mean of 46.3 billion barrels of oil, 281 trillion cubic feet of natural gas, and 20 billion barrels of natural gas liquids, according to an assessment by the U.S. Geological Survey (USGS). This estimate is for continuous (unconventional) oil, and consists of undiscovered, technically recoverable resources.